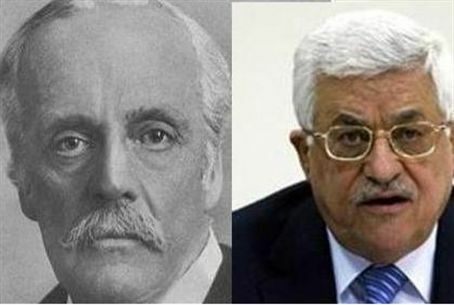 The PA continues a campaign to deny that Israel is a Jewish state: The "accursed” Balfour Declaration was part of Europe’s plan to get rid of Jews. The Palestinian Authority continues its campaign to deny that Israel is a Jewish state. It says the "accursed” Balfour Declaration was part of Europe’s plan to get rid of Jews. The message is being disseminated by both the Hamas terrorist organization, which controls Gaza, and the Fatah movement, headed in Judea and Samaria by PA Chairman Mahmoud Abbas. They are reinforcing the libel that Zionism started as a European plot to rid Europe of the "burden" of having Jews living among them, according to reports translated by Palestinian Media Watch. The Balfour Declaration of 1917 was a formal statement of policy by the British government stating, "His Majesty's government view with favor the establishment in Palestine of a national home for the Jewish people..., it being clearly understood that nothing shall be done which may prejudice the civil and religious rights of existing non-Jewish communities in Palestine, or the rights and political status enjoyed by Jews in any other country." The PA Ministry of Culture Administration in Tulkarm, located almost adjacent to the high-speed Highway 6 (Kvish 6) and 10 miles east of Netanya, held a political conference earlier this month to mark the 93rd anniversary of the "cursed" Balfour Declaration. The guest lecturer stated that the British plan for a Jewish homeland was "in order to be rid of this burden called the Jews, which troubled Britain and Europe, who wished to be rid of this burden - even at the expense of a different nation." Meanwhile, Hamas leader Mahmoud Zahar said that the Jews were expelled from Europe "because they betrayed, stole and corrupted these countries." He added that they will soon be expelled from "Palestine" as they were from Europe, "because of their crimes." Palestinian Media Watch previously has documented that rewriting the history of Zionism has been PA policy since its inception. The PA has consistently taught that the Jews came to Israel not because of their historical ties to the land, but because Europe "wanted to get rid of the Jews and their problems." Lecturer Na'aman Shahrour spoke about this anniversary, which still sticks in the throats of the Palestinians... Shahrour also spoke about the historical aspect of this promise and the reasons that led Balfour to commit to it. U.S. President Barack Obama stated in June 2009 that the Palestinian Authority has "to deal with incitement issues. There's still a tendency, even within -- among Palestinians who say they are interested in peace with Israel, to engage in statements that are -- that incite a hatred of Israel or are not constructive to the peace process. Now I think, to his credit, President Abbas has made progress on this issue -- but not enough." Congress members visiting Israel this summer were faced with an awkward moment when they were presented with evidence of continuing PA incitement.